Full Vision display case is designed with most view area. Made of durable melamine laminated material. Ships knockdown ready to assemble. Color: solid white. Half Vision display case is designed with storage area underneath. Made of durable melamine laminated material. Ships knockdown ready to assemble. Color: solid white. Jewelry display case is designed with storage area underneath & main focus on the top. Made of durable melamine laminated material. Ships knockdown ready to assemble. Color: solid white. Display cash register stand is designed for any size store. Made of durable melamine laminated material. Ships knockdown ready to assemble. Color: solid white. Open corner filler case is designed to create variety of counter combinations. Combine it with cases and counters to make U-shaped counters or L-shape. Ships knockdown ready to assemble. Color: solid white. 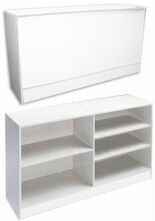 Store counter case is designed for any size store. Made of durable melamine laminated material. Ships knockdown ready to assemble. Color: solid white. Store cash register stand is designed for any size store. Made of durable melamine laminated material. Ships knockdown ready to assemble. Color: solid white. 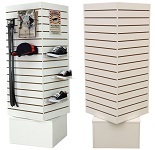 Store counter with 30"H slatwall front for extra displaying, 2"L or 4"L slatwall hook lengths recommended. Made of durable melamine laminated material. Ships knockdown ready to assemble. Color: solid white. Combination checkout counter has a spacesaver design, combination of a counter, 2 drawers and 4 shelves at the back, and front access showcase with sliding doors. Ships knockdown ready to assemble. Color: solid white. Counter with slatwall front allows to display impulse buys: candy, chips, soda. Impulse buys can be displayed with hooks, baskets, small shelves. Ships knockdown ready to assemble. Color: solid white. Display tower case is designed to showcase products from all sides. Made of durable melamine laminated material. Ships knockdown ready to assemble. Color: solid white. Display trophy wallcase with sliding front doors. Made of durable melamine laminated material. Ships knockdown ready to assemble. Color: solid white. 54"tall display designed with 3/16" thick tempered glass 12" deep shelves, chrome connectors, 54"L x 30"D x 6"H white base included. Base Color: white. 4-tiered glass display is 54"tall, designed with 3/16" thick tempered glass 12" deep shelves, chrome connectors, 54"L x 30"D x 6"H white base included. Base Color: white (not pictured). Descending tiers glass display is 54"tall, designed with 3/16" thick tempered glass 12" deep shelves, chrome connectors, 60"L x 30"D x 6"H base included. Base Color: white (not pictured). 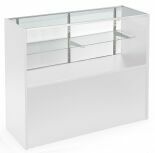 Designed with 3/16" thick tempered glass 12" X 12", chrome connectors, 30"dia white base included. Base Color: white base.